(Optional) Scallions or whatever you like with your eggs. Preheat your oven to 400 F. Grease up your Muffin/Cupcake Pan. You can either spray it down with some cooking spray, or smear some Coconut Oil all over it. 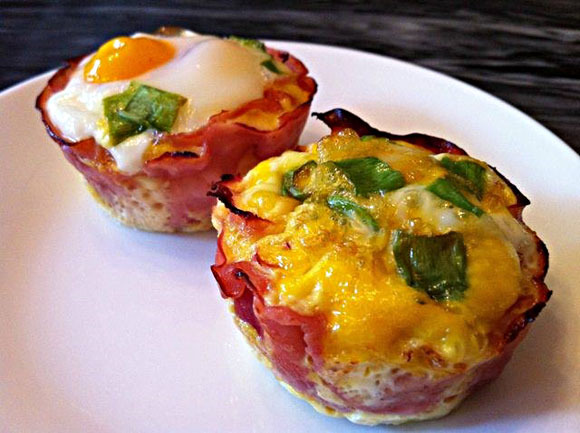 Fit 1 or (2 if ham is sliced real thin) slices of ham in to each muffin cup. (Optional) Depending on if you want your eggs all scrambled or not, you can crack an egg in to a separate cup and beat it before dumping it in to the ham cups. If you do decide on doing this, you can also mix in your other ingredients (think chopped mushrooms/scallions/spinach). If you like your eggs whole, go ahead and crack that egg in to the cup! (Optional) Throw a few pieces of chopped up scallions on top for garnish! Pop that muffin pan in to the oven which you previously preheated and bake for 15 minutes or however well you like your eggs. Re: the 15 minutes cooking time, the scrambled egg version was more well-done than the non-scrambled one, so you might want to keep that in mind.